Watch out! The Aliens are invading the virtual realm. However, they are not after humans. They appear to be looking for some sweet treats. Now that they have spotted the biggest stock of candies onto Cosmic Candy Heist Slot, they wish to abduct all of it! 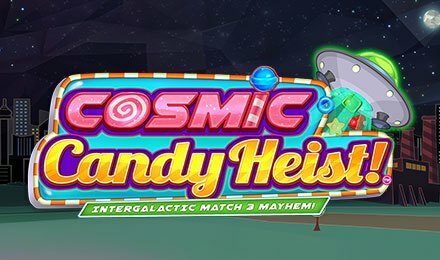 Assist two of the most courageous agents as they try to stop the Candy Heist through Cosmic Candy Heist Slot. Brought into being by Pariplay, be sure not to miss on this cosmically acclaimed slot game or else the virtual citizens might end up without any candy this year! Seriously, Cosmic Candy Heist Slot is not like the other slot games that you’ve played so far! This one required you to swipe left, right, up or down to match combinations of three or more similar candies. As a win is awarded, the candy symbols are removed from the reels and new ones take their place. Do keep the reels waiting! Hop onto your Vegas Spins account and load the game. You can adjust the bets per round as well. You are awarded 60 seconds per round. Once the round is over, you can use your wins to play more or cash out your wins. Bet Levels: Unfortunately, there are no Bet Levels on Cosmic Candy Heist Slot. Amount of Paylines Selection: This slot game by Pariplay does not use pay lines to award wins. As such, Pay lines are inexistent. Coin Values: You are allowed to choose your stakes at the beginning of each round. Before playing select the value that your deem convenient on the home menu of Cosmic Candy Heist Slot and play. You can choose from a minimum of £1 up to £250. Throughout Cosmic Candy Heist Slot, you can spot tokens and rockets. If you manage to create a winning combination at the location of the tokens and rockets, you are rewarded with them. They are used to obtain multipliers, Mystery Box and Power-Ups. As you obtain Rockets, you are rewarded with Multipliers. The more rockets, the more multipliers. 8 rockets award 25x multipliers. Did you manage to get more than 8 rockets on Cosmic Candy Heist Slot? Good news! You activated the Mystery Box Feature. You will be presented with three Mystery Boxes onto your screen. Clicking them will reward you with the prize. You can obtain multipliers amounting up to 250x through Mystery Boxes. Tokens are used to buy Power-Ups. There are three powerups available on Cosmic Candy Heist Slot. The Monster Bite will clear a line of candies from the reels. The Cherry Bomb will destroy a big chunk of symbols and the Time Power-Up will award 15 additional seconds. Here come the aliens in their saucers! Prepare yourselves to save the candies! Good luck!